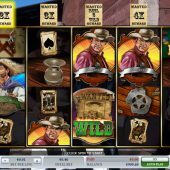 Gunsmoke slot joins some esteemed company in the Western-themed slot genre, namely Play'n Go's Gunslinger and Netent's Dead or Alive or if you prefer a softer take, their Wild Wild West game. Gunsmoke is set over a backdrop of a street corner in this one-horse town and we are accompanied by some weary old film music, but we do get treated to some original old Western movie clips when the character wins occur which is a nice touch by 2 By 2 Gaming. Will you be fast enough on the draw to leave this town with your gold intact though? Our stay in Lucksville begins with 5 reels of 4 rows, as we have 40 pay lines. The character symbols appear over 2 rows while the rest are all single, the Marshal being the top pay at 750 coins for a 5-of-a-kind win, which is 18.5x your 40-coin bet. Kitty the lady pays 250 coins, Festus 200, Pistols 150, Sheriff's Star and Pot 120 and there are some tatty playing cards for the lower awards of 80 or 60 coins. There is a Wild only on reel 3 but it does activate a random enhancement by highlighting one of the wanted posters that sit above each of the five reels. If landing on the reel 3 poster the Wild expands to fill all 4 positions - reels 1, 2, 4 and 5 have 2x, 3x, 4x and 5x multipliers respectively applied to any wins the Wild is involved in should any of those posters be lit. If 3 or more Card Table scatters land you are awarded one of two possible bonuses randomly. The first is the WANTED! 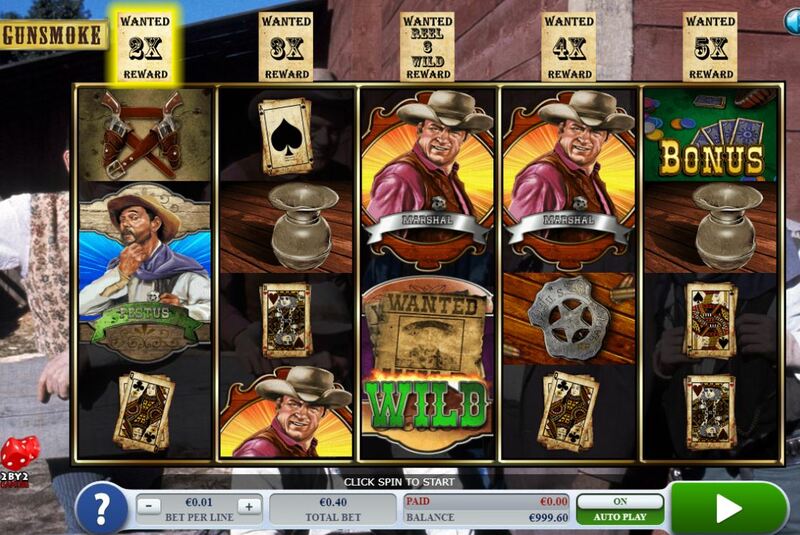 free spins round which gives 8, 12 or 16 spins for 3, 4 or 5 scatters respectively. The enhancement is the poster multipliers all being doubled for the duration, so 10x is possible and you can retrigger them too. You may get the Shootout Bonus which still awards free games at 15, 10 and 6 for 5, 4 or 3 scatters respectively but you get to pick from 12 cards too, one pick for each triggering scatter. You win the amounts on the cards and should any two amounts match you get an extra 2 free games. During these spins reel 3 is a sticky Wild for the round.